I always wish that I could post recipes here but I can’t claim to have any originals to my credit. I pick a recipe from a book/site, ensure that it meets my health/praana criteria, check if I can get hold of the ingredients, then make it my own. Tweak it a little, substitute ingredients, play with cook/bake time… and so on. 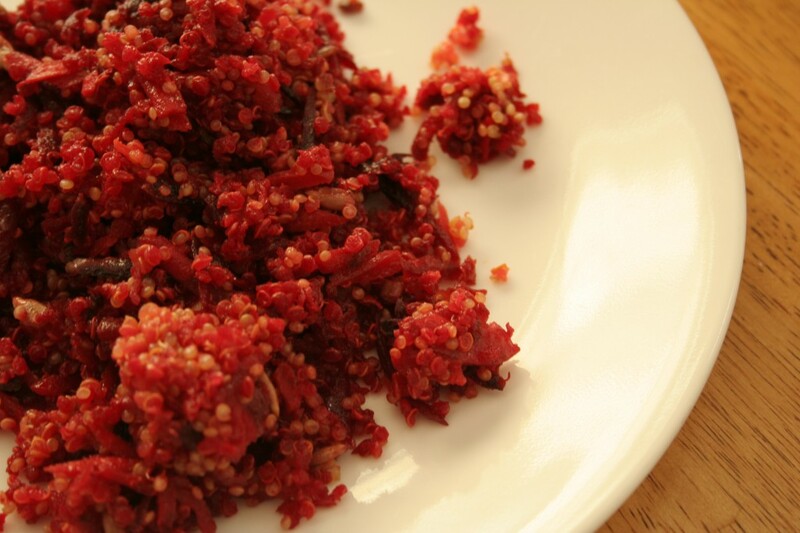 Like this Ruby Red Quinoa Salad. 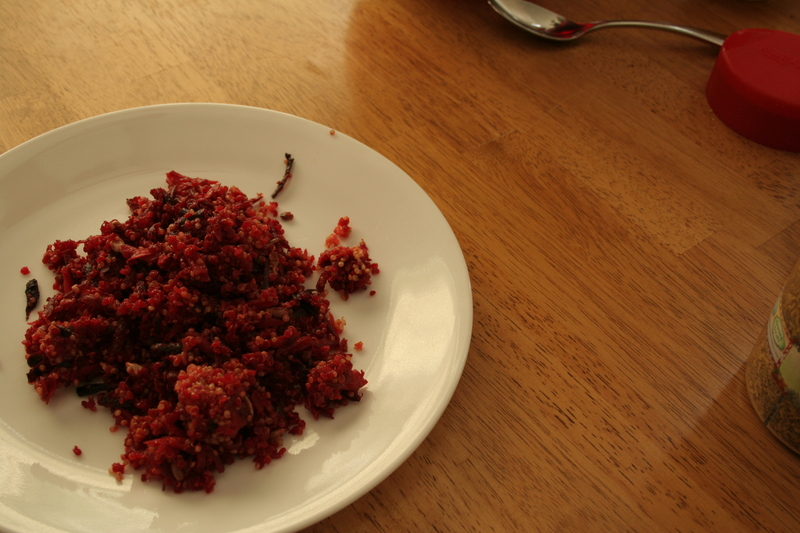 Maria Speck’s Ancient Grains For Modern Meals has a recipe for Cumin-Scented Quinoa that uses beets. I thought it was a nifty little recipe, easy to prepare and healthy. But I use a fair bit of cumin in my cooking, so I wanted to change things up a little. Toast the quinoa in a pan until the seeds begin to pop. Add 2 cups of boiling water and salt to taste, cover with a lid, then reduce the heat to a low simmer, allowing the quinoa to cook. As the quinoa cooks, a small ring is formed around each seed. You can sample a seed to confirm that the batch is cooked. Add the shredded beet and carrots, mix, turn off the heat, cover. The remaining steam is sufficient to cook the beets and carrots. Make a dressing by combining olive oil, lime/lemon juice, agave, ginger oil and Braggs liquid aminos. Whisk them together until a smooth emulsion is formed. Pour over the quinoa salad when it has cooled down. Add the cucumber and toasted sunflower seeds. Texture! Each time I say ‘texture’ with reference to food, P raises an eyebrow. Pretentious, you think? It is one of the things I learned after hours of watching Food Network. Anyway, this salad is a play of various textures. 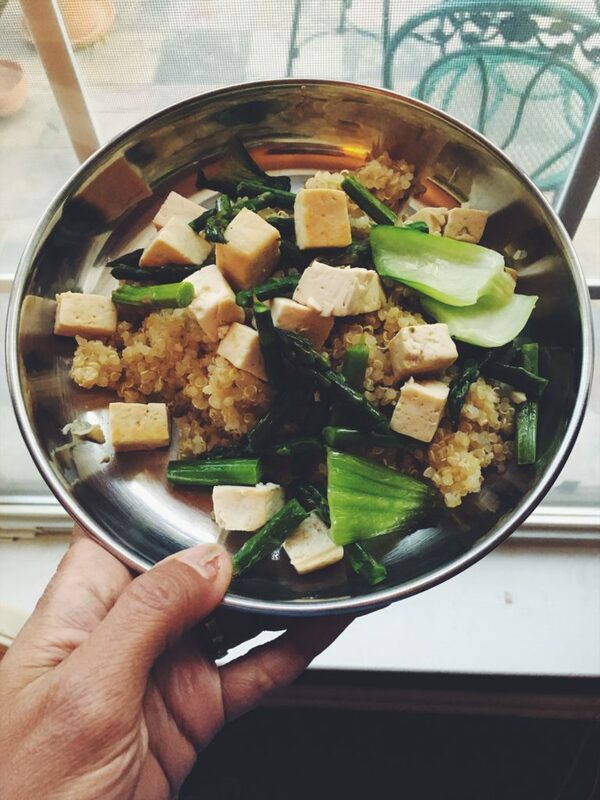 Crunchy sunflower seeds, soft quinoa, chewy beets and carrots… The first time I made the salad, I threw in some tofu. Added protein and yes, texture. You can experiment with the ingredients in the dressing. When I made this salad earlier, I used olive oil, lime juice, dried basil and sumac. Random, I know! It tasted awesome, though. If you’d like it spicier, add a few drops of chili oil. Slivers of ginger would add a subtle sharpness as well. Chopped garlic, fresh rosemary, maple syrup, freshly ground pepper… the list is endless. Toasted pine nuts would be a nice substitute, so also slivered almonds. Fresh herbs would work great in here as well. Feel free to add fresh basil, rosemary, cilantro… whichever green your heart desires. Each one would grant the salad its own distinctive flavor.